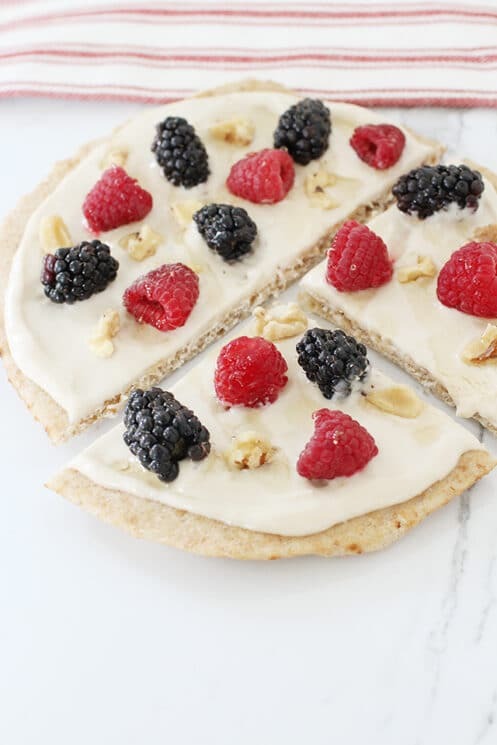 A non-traditional twist on Breakfast Pizza that will satisfy your kids’ sweet tooth AND their before school nutrition needs. If you search breakfast pizza, more likely than not you will get a recipe that includes sausage, bacon, eggs, cheese and possibly some veggies. 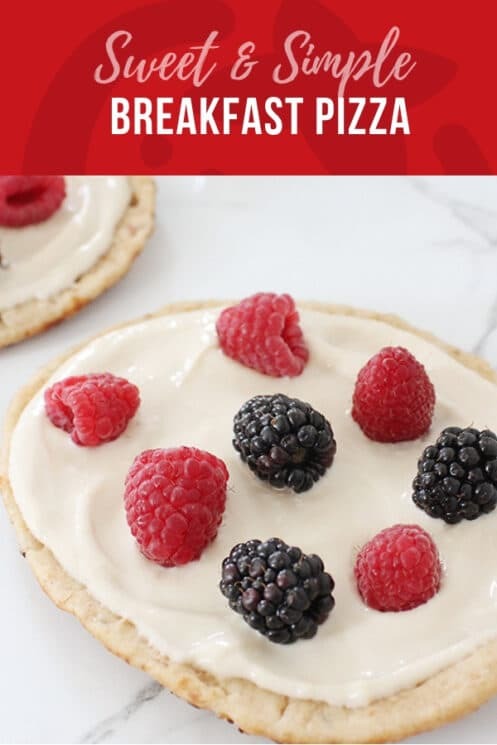 That style of breakfast pizza can be amazingly delicious, but we wanted a recipe that is a little more simple and less heavy for breakfast. 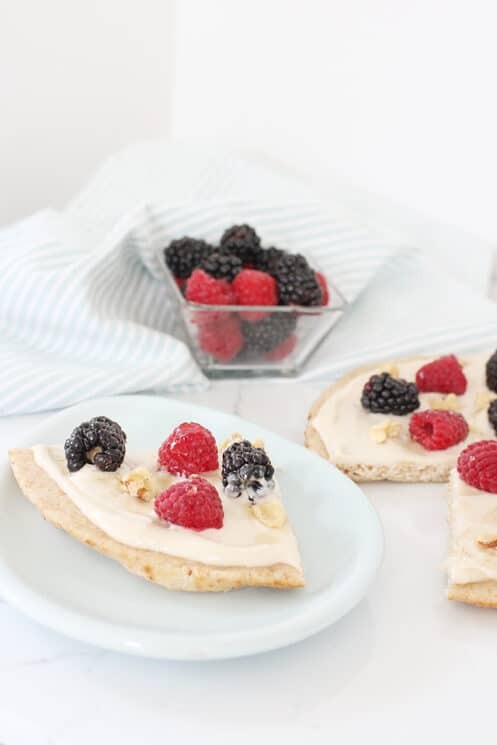 This combination is the perfect amount sweet, with just the right combination of whole foods to keep your kids satisfied and mentally alert until lunch. You can eat this breakfast pizza cold, or place the whole pizza in the oven to warm it through. What Are the Best Tortillas/Naan? Why Is Breakfast Pizza a Good Choice for My Kids? If you are searching for a recipe to feed your kids, and one catches your eye, you might be asking yourself – should I feed this to my kids? Let’s break down this breakfast pizza recipe to determine why it is actually a good choice for your kids. Naan Bread – This recipe recommends a whole wheat naan or tortilla. These are a good source of carbohydrates which are needed to give kids energy. They also have B vitamins which keep your kids blood cells healthy and help their bodies make energy from food. Berries – These are high in fiber which keep kids’ digestive systems healthy. Berries contain antioxidants that have been shown to help with memory. They also have vitamin C which can support oral health. Nuts – Nuts are a natural power-house of nutrients: protein, fiber, healthy fats which help kids grow, develop and learn. Looking for more Breakfast Pizza recipes? 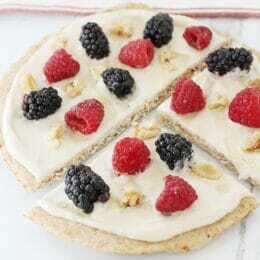 Spread onto naan bread and top with berries and chopped walnuts. Love your breakfast pizza, I use ricotta on everything these days! Love this idea. 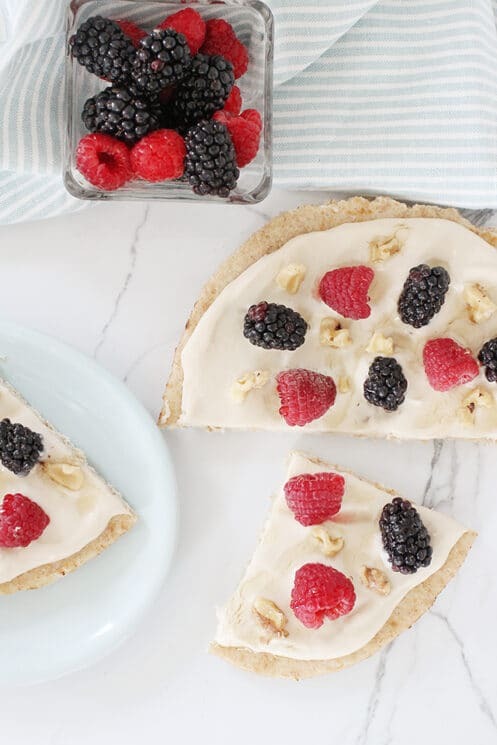 We’ve been floundering on healthy, interesting breakfast ideas. We’ll use toasted sandwich rounds for the base and yogurt for the “sauce”. Thanks for the inspriration! This looks yummy, my kids would hopefully eat it. The only know about the pepperoni kind of pizza. We did make your cabbage slaw over the weekend and I of course loved it but the kids didn’t care for it. Good luck on your exam. Sorry they didn’t like it. It really looks yummy. I will try it and hopefully we’ll all enjoy it. Thanks.